So Wrestlemania 33 is just 33 days away. That’s like barely a month! Have you ordered the balloons and Booty-O’s? Wrestlemania is celebrated as the year’s biggest holiday at my house, and trust me, we celebrate hard. But if you’re only celebrating Wrestlemania for one measly day a year, you’re missing out on so much. That’s why today we’re going to look at 33 different things you can do over the next 33 days to get hyped for the biggest event of the year. Any organized person knows that you start out by making a list. I’m making this list of ways to get you hyped, but I’ll make a dozen lists between now and Wrestlemania. 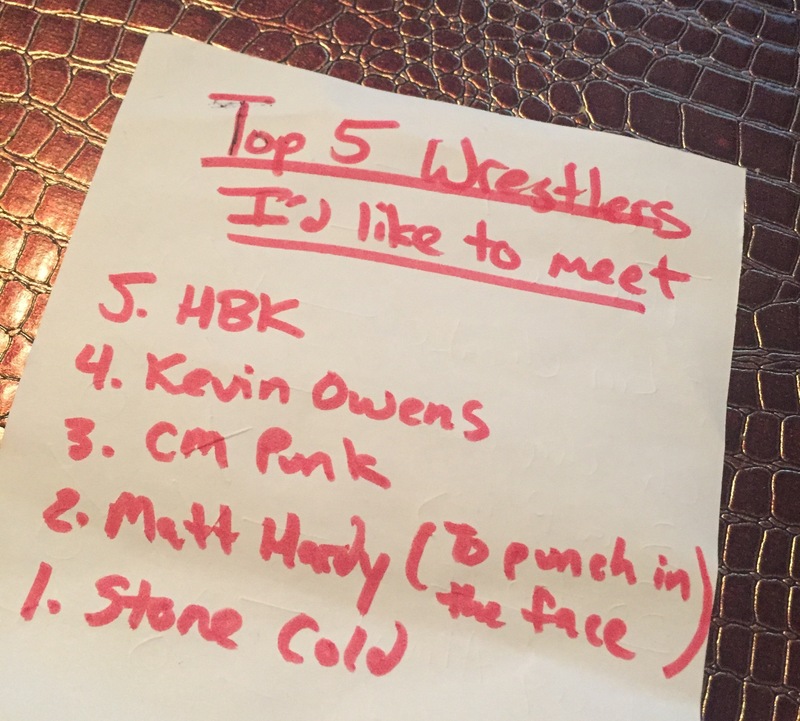 Make a list of your Top 5 favorite Wrestlemanias of all time, or your Top 5 Mania Intercontinental Title matches, or the greatest Six-Man tag teams ever assembled. Get your brain thinking about wrestling until it’s to the detriment of other important things in your life. Only then are you truly WM ready. 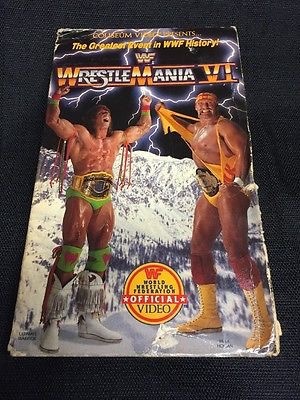 When we were growing up, our wrestling knowledge came from primarily two places – wrestling magazines and the old WWF tapes we rented at Nite Time Video. Nite Time Video didn’t have a vast wrestling collection, mind you. It was pretty much WMIII through WMVI. There may have been a random SummerSlam. However, you can’t go wrong with WMVI and its epic Hulk Hogan vs. Ultimate Warrior main event. It’s even better when you watch it full screen with the tracking a little off. It’s the way Bobby “The Brain” Heenan was meant to be seen. Bonus points if the tape has been abused by a few dozen other people before you watch it. Wrestling magazines are going the way of, well, the VHS tape at this point, but that doesn’t mean you can’t pick up a Pro Wrestling Illustrated or Fighting Spirit Magazine at your local Barnes & Noble. My brother learned to read with copies of PWI and WWF Magazine. Sadly, the printed word just can’t keep up with the speed of today’s wrestling industry. 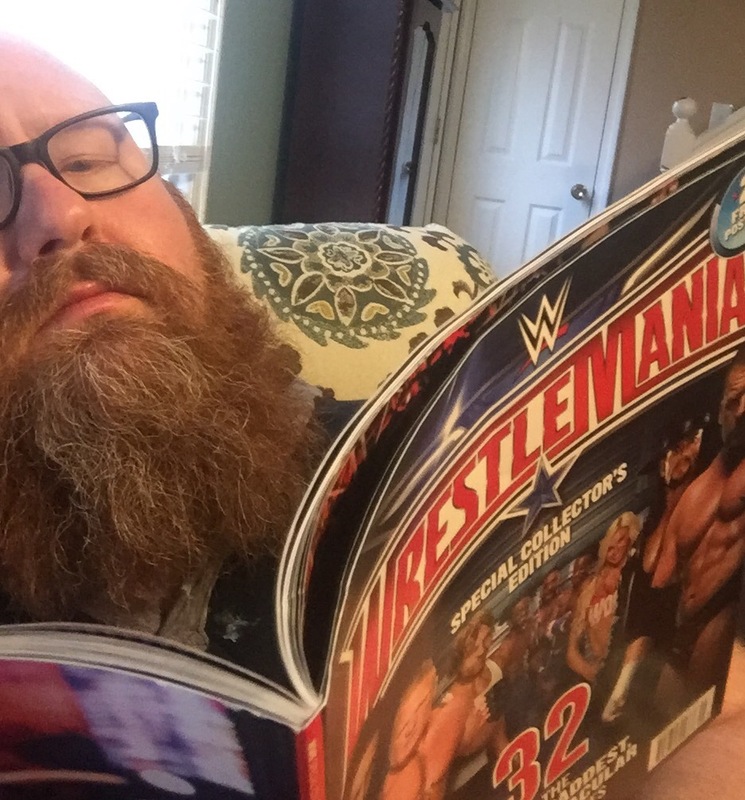 I like to pick up the WWE’s annual Wrestlemania souvenir magazine, but if you really want to get nostalgic, hop on eBay and search for old copies of The Wrestler or WCW Magazine. Join one of those play-by-mail wrestling leagues! Just thinking about wrestling isn’t going to be enough. You’re going to need to be constantly talking about wrestling, too. 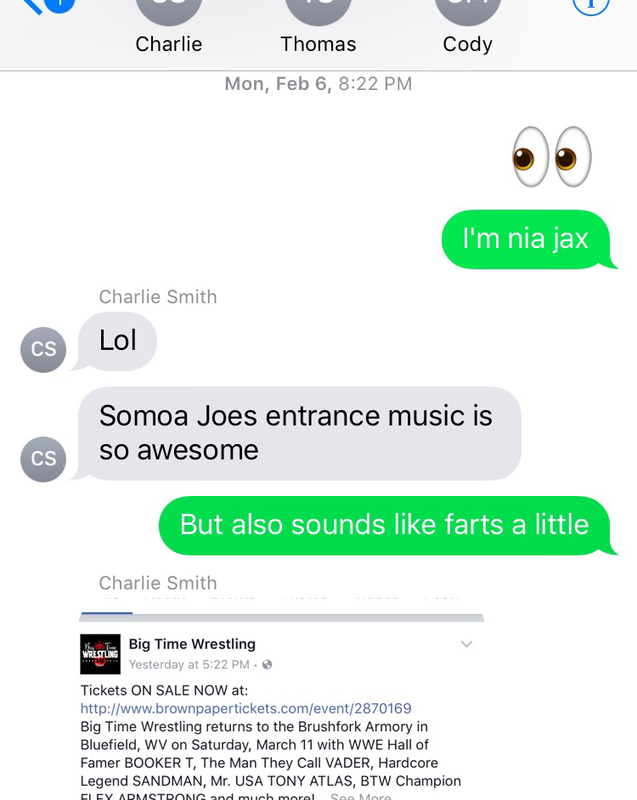 This is why it helps to have a wrestling text group. It’s pretty self explanatory – find a bunch of guys or girls (HA!) that love wrestling and get their cell numbers. Then, during SmackDown Live tonight, text all of them at once to ask what they should do with AJ Styles at WM33. Boom! You have a wrestling text group. I make playlists for everything, so it’s only natural that I’ve been making Wrestlemania playlists for the last 10 years. I like to include the Mania themes and entrance themes for all of the people wrestling on the show, but a wrestling playlist can be anything. Throw in some entrance themes for WWE Hall of Famers, or, my favorite, old entrance music wrestlers used to use on the indies. (Because “Unsettling Differences” was a million times better than “Fight”). Any song that gets your adrenaline pumping and gets you to start thinking about piledrivers and powerbombs is Wrestlemania playlist approved! Look – small children and girls were made for practicing powerbombs. It’s just a fact. And the best part of a powerbomb is that it’s impossible to get wrong. Standing, sit out, jack knife, pop up. Heck, even the Razor’s Edge was kind of a powerbomb and requires less strength. People act like they don’t want to be powerbombed before and during a powerbomb, but no reasonable person wishes they hadn’t been powerbombed after it happens. It’s a bonding moment, and gets you that much closer to ready for Wrestlemania. It’s easier in some regions than others, but the best way to get hyped about wrestling is to actually go to a show. Indie shows can vary, but if you go in with the right attitude, you’re gonna have a good time. Think of it as seeing a small band in a club instead of the WWE’s Van Halen in a giant arena. Sure, you won’t see John Cena, but you’ll probably see Ricky Morton. Not only will you see old favorites, but a lot of guys out working the indies are just one phone call away from showing up on NXT this week. 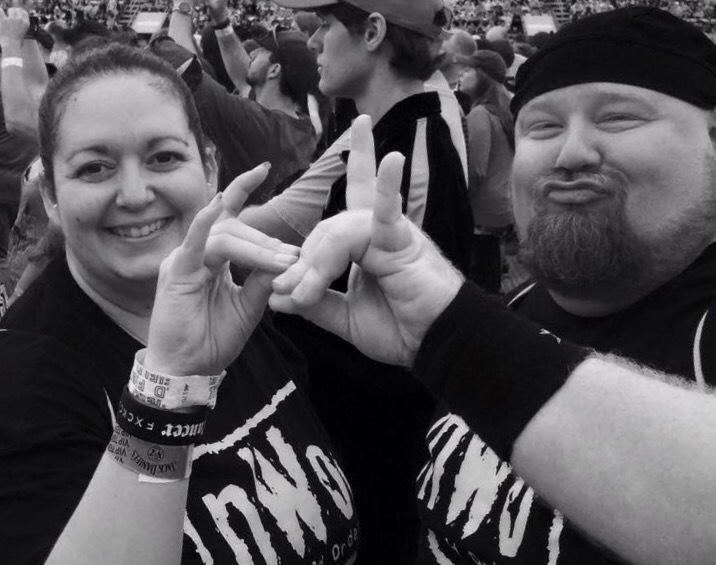 Be all smug when you say how much better they were before WWE ruined them! WWE has been putting out figures steadily since I was like 5 years old. My childhood was pretty much defined by the old Hasbro figures. So it was awesome to find out that Mattel was issuing a new series of current wrestlers in that old Hasbro style. I can finally have that Kevin Owens vs. Honky Tonk Man match I’ve only been able to fantasize about in the past. There are also the millions of other, regular WWE toy lines, as well as some weird WWE Mutants and Zombies lines that are both 100% awesome and perplexing. It was a pretty huge surprise when WWE announced that Kurt Angle would be inducted into the 2017 Class of the Hall of Fame. Angle, who has had his share of personal challenges in the past, has been persona non grata in WWE for over 10 years. So far, we haven’t gotten any indication that Kurt Angle will be stepping back in a WWE ring, but the guy has a great body of work to go back and check out. If you have the WWE Network, your choices are unlimited (my favorite is Angle vs. Shane McMahon from King Of The Ring ’01), but YouTube has a lot of WWE, TNA and other indie appearances from your Olympic champion. Check this match with AJ Styles out from TNA Hard Justice 2008. I’ve been playing wrestling video games since I rented that copy of WWF Wrestlemania from Nite Time Video. One great thing about the world today is you can go back and play so many games with ROMs or on the various console networks. Then you have used game places like GameStop where you can get old used games for like three bucks. If you’re buying, might I suggest WWE Legends of Wrestlemania – a great PS3 game from 2009 that is really fun. If you’re going on the cheap, I Googled “play WWF games” and came up with a playable version of the old Sega classic – Wrestlemania: The Arcade Game. Check it out here. If you’re like me, you have 20 wrestling t-shirts that you’re just wearing willy nilly in your day to day life. Now is the time to add structure to those shirts. Rank them from your least favorite to most favorite, and then wear them one a day in that order. That gets everybody in on the fun. If you have a job where wearing a t-shirt is frowned upon, wear them under your dress shirt and then tear your top shirt off like Hulk Hogan every time you leave for the day. It’s way easier to Hulkamania a shirt that has buttons. Bonus points because, when a fellow wrestling fan sees you in a wrestling t, they’re gonna want to talk about Wrestlemania. Add them to your text group and then powerbomb them in the Walmart parking lot! That’s the first 11. We’ll pick up again soon with 11 more ways to get you hyped for Wrestlemania!